Today was my first official day of Spring Break. It was pretty good. I slept in a lot and then I went to the eye doctor where I ordered new glasses! It is very exciting for me because I haven't gotten new glasses in 4 years so mine are starting to lose it... also I'd like to say that I ordered kids' glasses. Apparently my head is little? Weird. Anyway, I am doing this linky party because I really want to blog during break but I have nothing to say. You pretty much read what I do every day and I have nothing left over right now! :( So... linky parties it is!! 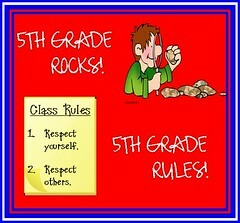 This is coming to you from 5th Grade Rocks, 5th Grade Rules! Are you married, do you have a bf, or are you flying free as a single lady/man? I have a lovely boyfriend! He is awesome. Where did you grow up? I grew up in the far out suburbs of Chicago and I am still here now. Do you have any pets? If so, what kind and what is his/her name? I have a dog and a cat. My dog's name is Max and he is a miniature schnauzer. Cutest dog EVER! And my cat is black and her name is Natalia although I call her Kiki or The Keekster. Yeah! What is a favorite TV show that you are embarassed to admit to watching? I don't really have any shows that embarrass me... so I will just tell you that my two favorite shows are Seinfeld and 30 Rock! Are you a saver or a spender? Definitely a saver, I get that from my mom. Although I spent a TON of money on glasses today... I guess that's why you save! What is your favorite children's book? I am a Mo Willems fan, specifically the Knuffle Bunny series! Were you the class clown, teacher's pet, or neither? Absolutely 100% the teacher's pet. Who is your favorite athletic team? Chicago Bulls!!!!!!!!!!!!!!!!!!!!!! I love you. The funny thing is that people find my blog by searching for the Bulls or for pictures of Derrick Rose's parents, which is weird. And now that I wrote that I will probably get more google searchers! Where did you go on your last REALLY fun vacation? I never go anywhere but I did go to California a few years ago and that was fun! I am not a huge clubber but the club scene in San Diego is WAY different than the one in Chicago. Who is your favorite actor? Actress? Hmmm... I love Jude Law and James Marsden and I have a newfound love for Alec Baldwin. And staying with that theme, I will say Tina Fey is my favorite actress! She is so funny and also very political! What is your favorite season? Spring! It's my birthday season (thank you friends for your kind wishes!) and the weather starts to get wonderful. And flowers bloom! What food do you just NOT like at all? I am a ground beef hater (don't tell my class I said "hate"!!). Who was your most memorable teacher and why? I always loved my third grade teacher, Mrs. Waites. She was young and we just connected for some reason. Now she is the principal of my old school and last year when I subbed, I found out that she led one of the first grade intervention groups every day and that just touched my heart. All right, that's the scoop! I'm going to have to explore the Knuffle Bunny series. I do not know this one. Wasn't When You Reach Me, so good?! Loved it! I'm on spring break, too! :) It's been a nice, restful couple of days so far! I will have to link up, since I have nothing to blog about either, lol. Hope you enjoy the rest of your break!